Thanks for your reply Durulz. It is not a case of "coming to terms with" Celtos being a battle and not a skirmish game, I merely wanted more of an idea of the direction the game was heading in. This last comment was really directed at Brigade, so any concept art or anything else to show off? Here's a way around it. 'Old' Celtos is still alive and still stocked and supported by Brigade. Why not think of that as the skirmish version? In truth, it does work better with fewer models. 'New' Celtos and 'Old' Celtos share the same troop types, the same spells, and the same background. The mechanics are completely different and incompatible, but the names and effects are the same. You could use Old Celtos for skirmishes and New Celtos for when you want a bigger rumble! That could be an idea. What size units and forces work well with the old Celtos rules? 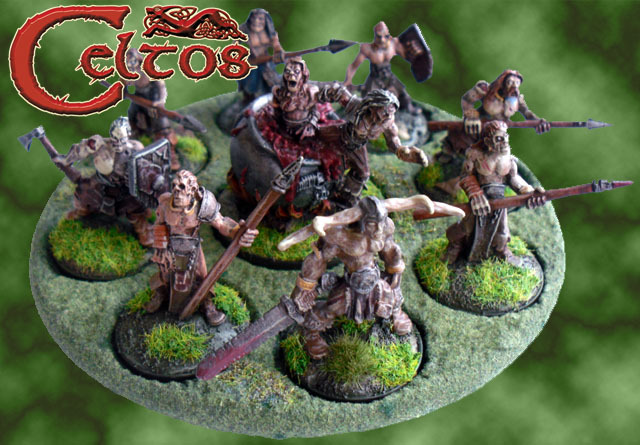 hairynorseman wrote: What size units and forces work well with the old Celtos rules? Thanks Germ, I'll have a look. So, are units basically just a single stat line and the number of models only represents hit points and morale modifiers? Since you're doing the rules from scratch why not just make something that works with a large-scale skirmish game? Warmachine plays pretty quickly and can involve good-sized armies. AT-43 had armies about the size you guys are looking for but it played super fast. It is actually possible to make a good large-scale skirmish game that can be played in about an hour or so. On a side note, since Celtos is going large scale, have you guys looked into doing the miniatures in a resin-plastic similar to those done by people like Mantic? Metal miniatures are getting so stupidly expensive. It seems most companies are ditching it for resin-plastic or a similar alternative. It's so much cheaper, looks just as good, is considerably lighter, and much nicer to convert and paint. Metal miniatures are ok for skirmish games because you don't need many, but it seems needlessly expensive for a mass combat game. shadowdragon wrote: So, are units basically just a single stat line and the number of models only represents hit points and morale modifiers? Yeah, that's a reasonable summary. The four of us had a big playtest session yesterday. Core mechanics are now deemed to be solid and working. It's the tweaking we are now on. Early next year (Jan/Feb) we will pass the game over to other club members for a beta test (the reason for passing it to club members is that we can get instant feedback). I know Tony took some photos of yesterday's game (you'll have to forgive some of the terrain - we forgot to bring any so had to use bits of card cut out, but it did well for a test) so he may post some pictures either here or on the blog. I am wondering if you plan to stay with the 10-sided dices or switch to D6 instead. Also, how many stats will be preserved in the new system? Apologies I missed your post on this. the 10 sided dice is staying, as to the stats those will be reduced in number comparred to the old system as the new whole unit based approach doesn't require them. Germ wrote: Apologies I missed your post on this. the 10 sided dice is staying, as to the stats those will be reduced in number comparred to the old system as the new whole unit based approach doesn't require them. Thank you for reply, Germ. It seems you've changed really a lot in the system. Do you plan to stay with similar structure of game turn? I have to say i always had a liking for the interactive system of Celtos rather then the usual I go - you go. I've noticed you plan to use cards for activation of units. I am little bit afraid of this, as it can change the game from tactical to chancy. This is for example Nemesis of the Dreadfleet game system. I kind of like the idea of coherent units on "cd" bases, but I would probably prefer just an update and tweaking of the current rules. They were already tested by many players, and it's well know were are the pros and cons. We mentioned early on that this will not be Celtos 2nd edition. We wanted to take the game into Mass Battle, tweaking the original rules wouldn't have achieved this. heavily influenced by the mythology of the time, having fate play a part seemed more than appropriate. The card activation will have a few surprises in it rather than just a roll call. Do check out the Celtos entries on the Brigade Blog, we will post updates there as we have them. Germ wrote: The old system worked ok with about 5 units per side. It was the size of the unit that made more impact. Units of 4-6 combatants often saw units rout after one melee, 8-12 per unit you got more of a fight. 5 or 6 units aside sounds like quite a good game. It's been a while since I last looked at the Celtos rules and tho I could see the influence they didn't strike me as just Warhammer with D10s. They definitely needed a little streamlining from what I can remember and having units snaking around the place in base contact seemed a bit odd to me...like a conga if your going through terrain. I think it is a great shame that GW haven't spent the last 30 years actually refining and improving the rules of their games, to me at least they do seem to be rather bloated and ungainly. Overall, I am intrigued to see what Brigade has in store but I think I prefer the idea of smaller games at what I'd class warband level; around 4-8 units aside with each unit having 5-10 minis for infantry, 3-6 minis for cavalry or maybe a monster. The main issue of the "old" rules is balance between the forces. Some units are just overkill and some are too poor to be to much use (played Fir Bolg). Another problem was luck of flavour. The rules are not really interesting, just very common set without any hook successful games include these days (Saga, Lion Rampant etc.). The new activation system could work like that, but it fits better to small skirmishes than mid-size battles IMHO. Well, balance between the forces is a relatively easy fix; internal play testing and getting the community to help even things up. I suppose the flavour of the rules helps to make a game stand out but personally, it's the setting and the minis that draw me into a game.The rules are important but I prefer a smooth, unobtrusive ruleset to something flashy just to stand out. I've recently had a butchers at the Celtos rulebook and even after a brief flick through its clear, to me at least, that it's a little bloated in some areas and could do with cutting away some of the fat. Again, it will be interesting to see what Brigade have done with the new rules and I look forward to flicking through them when / if they go out for external playtesting in the wider community. Mind you, the Celtos boards are VERY quiet so there may not be much of a community left out there; we'll see how many people come out of the woodwork once something arrives for us to get our teeth into.